Copper is a relatively soft and ductile metal which is commonly used as an undercoat or barrier process between the basis material and the desired plated final coating. Often it is required to apply a copper and a nickel coating prior to application of a final coating such as hard gold plating. Both alkaline and acid processes are available. 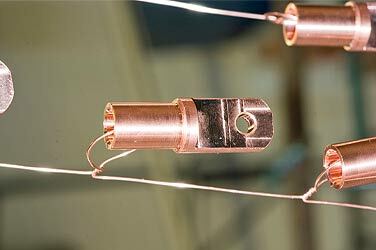 Copper is widely used in the electronics industry but has a particular use with the manufacture of printed circuit boards and for the plating of through holes. It may also be used as a stop off for selective case hardening of steel parts and for the coating of electric cable and wire. It may also be used for decorative purposes however in air it oxidises quickly and is easily tarnished as plated.